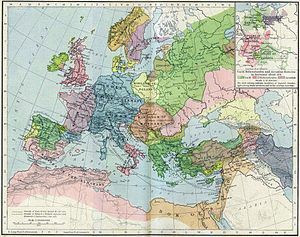 The Middle Ages is the period of history between the fall of the Western Roman Empire in 476 and the appearance of Germanic kingdoms until the fall of Byzantine Empire, invention the press and the end of the Hundred Years' War in 1453 or alternatively the discovery of America in 1492. The Middle Ages was a big change for Europe and the Mediterranean area, both in the political, economic, social, and cultural. Classical organizing society Roman Empire disappeared. Eastern Europe was isolated. Political power was disrupted, trade became much more complicated, feudalism replaced the system of slavery and classical knowledge was forgotten or within reach of a minority. But during the Middle Ages also they began to lay the foundations of modern society. In any case the Middle Ages was very different depending on the territory of which it is spoken. In the southern Mediterranean and from the seventh century the Islam expanded in Europe Carolingian Empire arises. Later in the Iberian Peninsula in what is now Spain and Portugal appear a melting pot Kingdoms fighting for their space: Al-Andalus, Taifa kingdoms, Almoravid, Almohad, Kingdom of Portugal, Kingdom of Navarra, Corona de Castilla, Kingdom of Aragon, United Nazari. Notable events of the Middle Ages were the Crusades. The Middle Ages is divided into early Middle Ages, the V and X century to the late Middle Ages eleventh to the fifteenth century. During the late Middle Ages society becomes, appearing the bourgeoisie and starting again booming cities. The Byzantine Empire maintains high levels of artistic production with great works.